It is well known that audiences in China are not prone to silence during performances, so it was a little eery to see them very still and very attentive, many sitting forward on the edge of their seats - equally for all of the many kinds of music we presented - from Mexican Baroque, to shape note singing, to folk, jazz gospel and contemporary - you know, what we do. Even the many very small children present were quiet - except for one not inappropriate intervention during Brent Michael Davids' Night Chant. They came back after intermission, so we figured it must be going OK. Then the atmosphere became warmer and warmer and somewhere in the middle of the second half, people being shouting their approval. Amazing. As we seemed to be leaving for good after our first encore ( an arrangement by Chen Yi of a Chinese folk song), there was a shout which sounded like "No," so we came back out and sang Molihua - another Chinese folk tune. 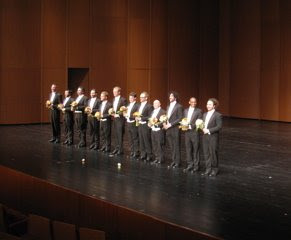 Of course the titles had already announced the encores, nevertheless we really felt that the audience didn't want to let us go.